The White Glow Crucifix - pure white with just the right amount of "glow" added makes this crucifix a nice reminder to pray when placed by your bedside. It goes well with any color bead and string! Our Glow-In-The-Dark crucifix will maintain their glow when placed near artificial light. Use them in rosary kits designed for children to hang on their bed post so before they go to sleep at night, they will see the glowing crucifix and be reminded to say the rosary. 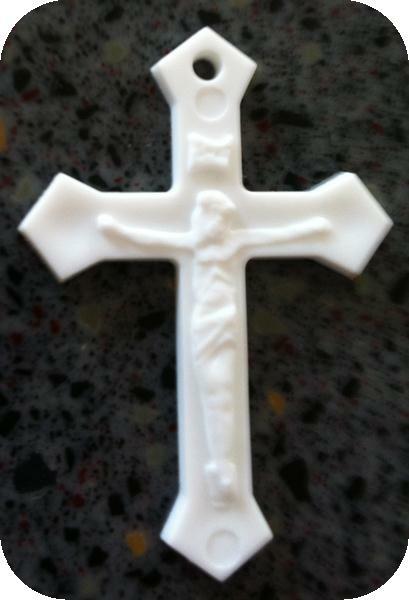 Click the button below to add the White Glow Plastic Crucifix to your wish list.